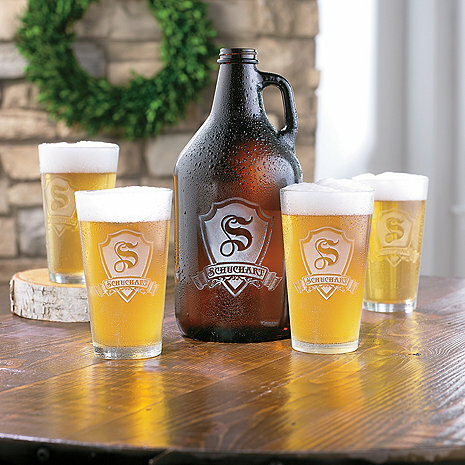 The custom-engraved shield, personalized with a single initial and name, is what makes these worthy of the best brews. Can I still get these in time for Christmas? BEST ANSWER: Probably! I purchased mine on Oct 6, and I received it on Oct 9th. They have a fast turnaround! I'd order now to be safe it will come before Christmas. You won't be sorry, they turned out amazing! Do you carry customized/personalized yarai soaker glasses? Can I purchase glasses only? I ordered growler and 4 glasses, but I would like to purchase 4 more glasses. Yes you can! Item # 779 03 04. Personalized gift arrived earlier than I expected. Pleasant surprise. Very well packed. Hats off to all for providing excellent service. I ordered these as a gift for my brother, who has just started brewing his own beer. He absolutely loves them! He commented on the high quality and the depth of the etching. I will definitely be ordering these again in the future! Pretty cool to have your growler personalized with your name. I have two brothers who are craft beer addicts so I decided to purchase one of these sets for each of them as a gift. I couldn't have been more impressed! The quality of craftsmanship with the engraving of the personalization is something you cannot appreciate from the picture. While it does state that it takes an extra week or two to arrive due to the personalization, I found that they arrived relatively quickly despite the fact that I ordered this before Christmas. I have already received pictures from my brothers thoroughly enjoying these beautiful growlers and glasses! I wouldn't hesitate to purchase this set for the craft beer aficionado in your life! I purchased this for my son-in-law, and both he and my daughter were impressed with the packing of the set, and said the engraving was deep and very beautiful. Every piece was perfect, and excellent quality. They both loved it, and I feel great having sent a gift from your company that should have gone for 3 or 4 times more money! I know I can trust you, and know you have great products. Thank you very much!